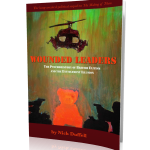 Wounded Leaders: British Elitism and the Entitlement Illusion - a Psychohistory Acclaimed sequel to Nick Duffell's The Making of Them Click here to read more. The Making of Them , inspired by the book, beautifully rendered by Steven Tart. Training and specialist supervision for therapists: see here for events; or to arrange a CPD day with Nick for your organisation contact us. 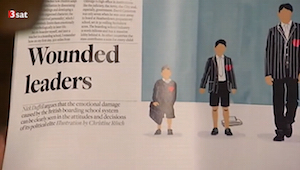 Is there a hidden well-being crisis in today's boarding schools? Watch short investigative film. UCL Research Project: Healing the wounds of yesteryear with the technology of tomorrow. Juliet Brown and Nick are researching whether VR technology can be used therapeutically to heal childhood attachment trauma like boarding. For details contact Juliet. 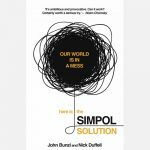 Nick’s new book on current affairs, ‘THE SIMPOL SOLUTION’, co-written with John Bunzl, endorsed here by Chomsky & Wilber etc. Click here to order by return of email. STOP PRESS: NVR Northampton conference, ‘Towards Trauma-informed Practice’ will mention boarding children starts 23 January, details here. New: The first ever training in Menswork Group Facilitation is available here. Audiobook of The Making of Them now available for instant download here. Finding Our Way Home – new book of women’s boarding experience available here. German TV 3SAT on Boarding School Survivors. Click to view (in German) - starts at 31.10 mins, download English transcript here. Boarding School Survivors can help. In order to raise public consciousness, we research, lecture, write, and broadcast about the psychological effects of sending children away to school, and the social system which has encouraged this habit. 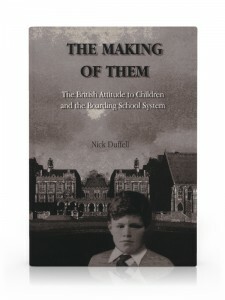 Nick Duffell’s book, The Making of Them: the British Attitude to Children and the Boarding School System has received wide acclaim from doctors, therapists, educators, writers and general readers. It describes the history and social context of boarding, the inevitability of ‘Boarding School Syndrome,’ as well as the process of de-constructing a ‘Strategic Survival Personality’. It offers pointers towards a philosophy of education that honours the needs and the intelligence of the natural child. His new book, Wounded Leaders: British elitism and the Entitlement Illusion – A Psychohistory, shows how this uniquely British system has affected the whole of society and contributes to our political malaise. Secondly, we run a programme of therapeutic workshops for adults who have recognised that they may have paid a price for their education and are looking for ways to understand and heal their wounds. These popular courses, which have been running uninterrupted since 1990, receive referrals from GPs, community organisations and counsellors, and have benefited many people, by allowing them to leave aspects of their past behind and develop their true potential. We also offer private psychotherapy for individuals and couples counselling through an increasing network of specialist practitioners. We provide seminars, in-house training and CPD events to inform and train counsellors and therapists in this little known syndrome, and to support them in working with this difficult client group. Our 2016 training programme is currently recruiting – see here for details. We are developing a nationwide group of informed specialists to whom we can refer and we receive requests from many parts of the world. We have increasing links with and support from some of the most senior practitioners and neuroscientists. please explore this website. Here we offer a range of resources (books and articles), information for boarding school survivors, and events, as well as information for therapists and links to other support services. If you would like to organise an event in your area or country, or enquire about training or consultancy, please send us an email via the contact form. Video excerpt from the Edinburgh University debate “This house would ban boarding for the under 16’s” on November 19 2014. The motion was overwhelmingly carried. Click here to view a list of books and articles related to boarding school therapy and psychology. Are you under 18 and in need of help or advice? Please call ChildLine on 0800 1111 and their counsellors will be able to offer the support you need.